It is my deep belief that knowledge brings about positive change. We could live in a world where the same instrument that can show a child how much chlorophyll is in a leaf could also show how them much pollution is in the air around us, or given off by one’s car. As an educator and a researcher, I feel that if people could easily discover things about their worlds that were also important social topics, that they would then make positive social choices, like reducing their emissions, or petitioning for cleaner industry in their communities. By having access to general inexpensive sensing tools, people can learn about healthy leaves, clean air, clouds and the water cycle, energy efficient homes — and visualize abstract concepts like spectra or magnetism. As a tool for exploration, we can discover things around us that we don’t already know. And that’s what it’s about. Little discoveries, everywhere. 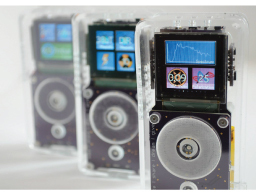 The Arducorder Mini is the latest Open Source Science Tricorder, and includes about a dozen sensing modalities including visible spectroscopy, radiation measurement, thermal imaging, and various atmospheric, electromagnetic, and spatial measurements. 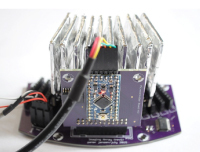 The Arducorder is Arduino-compatible, allowing even new programmers to leverage the Arduino learning ecosystem to make meaningful sensing software quickly. Computed Tomography scanners are volumetric 3D scanners that measure not only the surface of an object, but also scan it’s interior volume. This desktop-sized second version of the OpenCT project includes a parallel detector array with 16 detectors, making it a working pedagogical model for third-generation CT scanners. Currently in progress. A prototype desktop computed tomography scanner and working model of the first-generation of CT scanners. Includes a single linearly-scanned detector, a Barium-133 radioisotope source, and a rotating bore detector. 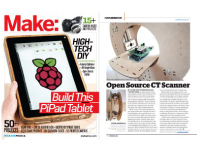 Featured in MAKE Magazine. 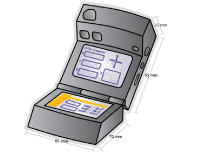 The first iterations of the Open Source Science Tricorder project, a handheld device containing a diverse array of nearly a dozen atmospheric, electromagnetic, and spatial sensors, and primarily suited for science education. Featured widely in international news media, including Reuters, Forbes, Wired, MSNBC, and the Washington Post. 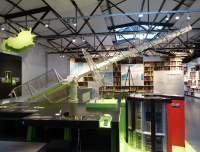 See the earliest prototype of the Open Source Science Tricorder on permanent exhibit at the German Museum of Technology in Berlin!